Touted by PR pros, the PESO model is an integrative approach to PR that helps us visualize and advance both brand and business goals. 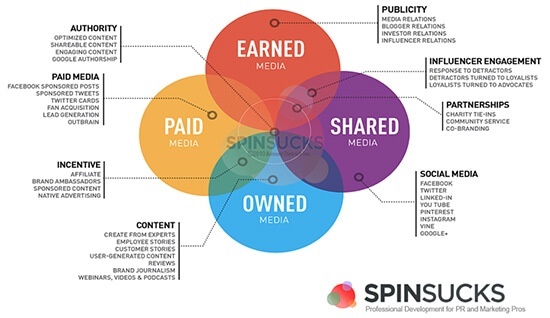 By combining four pillars of media (paid, earned, shared and owned), PESO merges the best parts of each to form a strategy that gives you the most bang for your buck. The strategy that the PESO model represents perfectly embodies this alignment and the end goal of establishing yourself as an authority or thought leader in your area. PESO pioneer Gini Dietrich says owned media is the best place to begin because you can control the message. By formulating a killer content calendar, you can discuss industry topics, create debates around those topics, interview influencers, extend the shelf-life of your content and showcase your prowess. Access KNB Communication’s exclusive Content Curation Grid free! Now that you have your content (owned media), you can now use “shared media” to disseminate it across the web. Here you’ll be able to use the many tools at your disposal, test your audiences, and expand your reach. We like to use Sprout Social and Hubspot Social Media Marketing for automated content sharing. As for social networks to share on, not every platform will be right for you. Twitter, in recent years, has been teeming with opportunities for healthcare marketers and we consider it the top platform you should be using. A good rule of thumb is to consider your resources, target your desired audience, and test it out. Google +, Facebook, LinkedIn, and others like Reddit and Pinterest are also good places to start. The next step in the PESO method is to amplify your message with paid media. Sponsored content, native ads, and blog sponsorships are all examples of how you can get eyeballs on your content. Sponsored Tweets, Facebook, and LinkedIn posts are also very simple yet, effective ways to get new readers and customers. And you don’t even have to start with a large budget. One thing that I have come to appreciate are the free ad coupons LinkedIn sends to marketers and those who use the platform often. Can’t say no to free advertising! Now that you have put your content out there, it’s time to build relationships with stakeholders and demonstrate value. After all, in today’s world it is becoming difficult for consumers to just “take your word for it” which means you’re going to have to “earn” that trust. This is, of course, where the PR profession can flex its muscles. Build lists of industry bloggers and journalist - follow them, give them a shout-out, and consider starting conversations with them in the space. Create lists of related books, podcasts, and videos you want to review and share. The karma you accrue from these simple actions can lead these influencers to introduce you and your value to their audiences. Taking these extra steps will often work in your favor because you will build trust, and others, even your competitors, will begin to see you as an expert. Gone are the days when sending out an email blast or launching a single-tiered social media campaign was enough. It's important to engage in tactics that align your mission with your marketing goals, while ensuring the staying power of your brand. PESO makes this possible. “It helps us extend beyond media relations and crisis communications and event marketing and reputation management,” Gini Dietrich says. We know change is hard, but if you were given a key to success, would you throw it away?